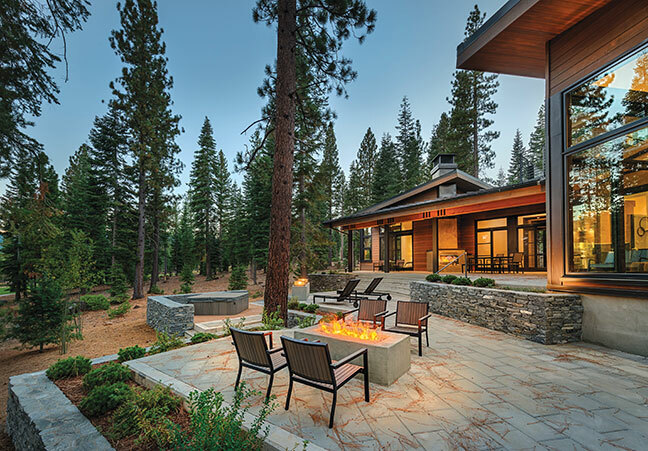 When clients approached architect Nick Sonder about a contemporary mountain home for their golf course property in Martis Camp, they specified that it be as environmentally friendly as possible. 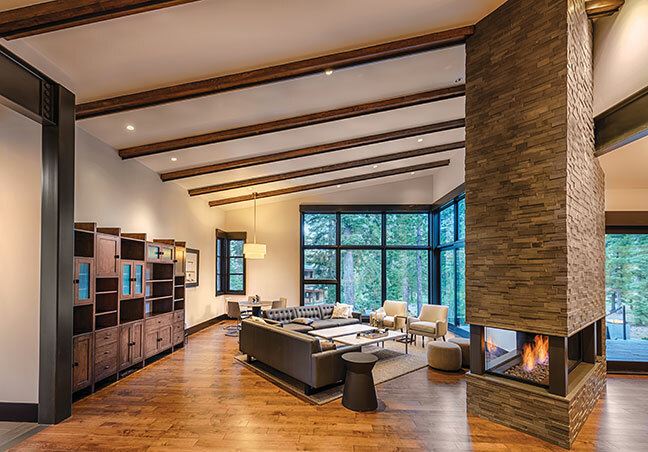 Sonder, working with Mike Nethersole of Truckee’s MD Construction, began designing the home using the LEED guidelines set out by the U.S. Green Building Council. The design process began in summer 2009, and the project broke ground in late 2010. “From the start, we discussed more active green features,” says Sonder. A dozen 250-feet-deep wells supply the ground-source heat pump, and integrated solar panels on the roofline take advantage of the area’s copious sunshine. Though Sonder sited the house to maximize solar gain, “we also provided a lot of covered areas to help with the cooling load,” he says. The home features covered patios on the east, west and south sides, encompassing some 1,200 square feet of outdoor patio space. The architect also took note of the sun’s positioning as he designed rooflines. Low-pitched shed roofs are oriented to allow winter sun in, while overhangs shade the home in summer. Inside, the home is spacious without being overwhelming. “The home is constructed in a simple manner, using less resources,” says Sonder. All plumbing fixtures are low-flow and materials, such as Caesarstone countertops, were picked for sustainability and renewability. “We took extreme care in choosing everything so that it was environmentally friendly at the house,” says Nethersole. One of the aspects separating this LEED gold home from a silver certification was the attention paid to indoor air quality. “What we could do offsite, we did offsite,” says Nethersole. 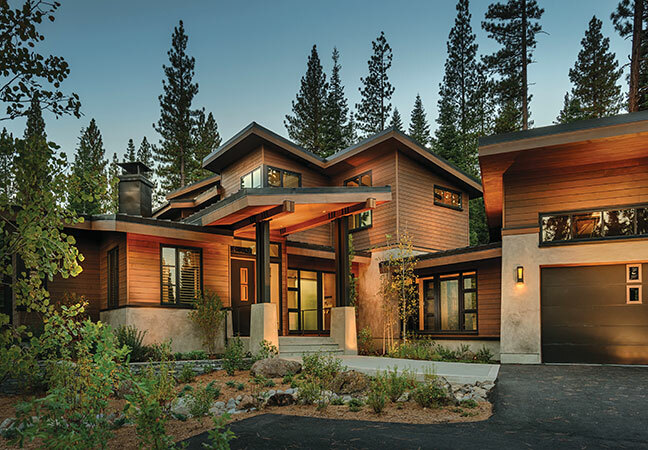 MD Construction built the doors, cabinetry and siding at its Truckee manufacturing facility, which minimized the home’s carbon footprint by staying local. The company also used all low-VOC (volatile organic chemicals) plywoods, glues and finishes. All waste products were managed to put as little as possible into local landfills. Nethersole is currently installing a control system that will allow the owners to remotely monitor and control the home. A three-sided basalt fireplace separates the great room from the dining room. Abundant windows display the dramatic forest location, and sliding window walls open the inside to the out. A large master suite is complemented by three additional bedrooms for family and guests, and a partition wall in the media and exercise room allows the spaces to be used separately or together. The rooftop deck over the dining room amplifies the indoor/outdoor experience, while warm woods and finishes throughout add balance to the contemporary style and serve as a stunning reminder that green building is anything but stark.